Manit Center Max, we attend on driver’s safety. 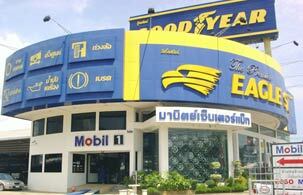 We offer standard quality tire, wheel with mag wheel in Thailand and foreign countries. Our oil department will take care of your car efficiency, prolong your car endurance and oil checking. Manit Center Max always gives the finest service to every customer by high technology computer system working and professional staffs that are well-trained working. We serve with smile and make your first impression when you come at Manit Center Max.